Summer is the season of great heat and you need a drink which works as a cooler for you in the sunny hot days. In summer, everyone’s main focus is drinks. On a hot summer afternoon, what you need is a refreshing drink to cool off. 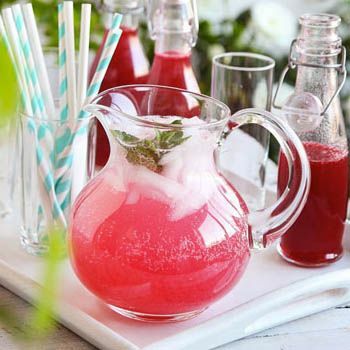 A large number of summer drinks, sodas, lemonade and many others are being used by majority of people. Most of the drinks are loaded with anti-oxidant rich ingredients and are full of health and nutrition. I must suggest you to go with natural fruity juices or drinks that will work as cooler for you and refresh you whenever you need. Mix seasonal fruits with juices and wines to make refreshing drinks to enjoy during the hot long summer days and evenings. Are you looking for refreshing and new summer drink? This summer try a new drink which is peach blush cooler. It’s a cocktail having flavor of peach and keeps you refresh all the time during hot sunny days. Beat the heat with this cool summer drink from blended fruit drinks to creative twists. Peach is fruit full of health vitamins, fibers and nutrition. Peach is also a sign of summer season. Raw peach juice can also be great solution to quench the thirst and recharge your body with energy. If you will drink peach blush cooler in this summer, you will definitely stay healthy and keep away from hazardous stomach diseases too. Peach has many benefits as it contributes in eye health, toxin cleanser, excellent for skin, control weight, full of vitamins, work against cancer and heart disease, rich source of anti-oxidant, fibers and necessary nutrition and the most important thing it keeps you cool all the time by beating off your heat. Are you looking for the recipe of peach blush cooler? I have mentioned the drink recipe of peach blush cooler. Follow the recipe below and stir up a delicious peach blush cooler. 1. First of all, fill the glass with ice. 2. Then add 1 tbsp of fresh fruit on the top of the ice. 3. Now pour each ingredient in a mixing tin or blender and shake it two times until it gets blend properly. 4. Then pour all ingredients in a glass and top it with sierra mist. 5. Garnish the rim of glass with a lime wedge and summer stirrer. Your delicious and yummy peach blush cooler drink is ready to serve. Beat summer heat by drinking cooling and refreshing peachy drink Peach Blush Cooler. The recipe of this cocktail is simple, easy and quick. You must give it a try in this summer to stay cool and refreshing.